Mary’s mortified in this week’s episode as she has to have her tonsils out. 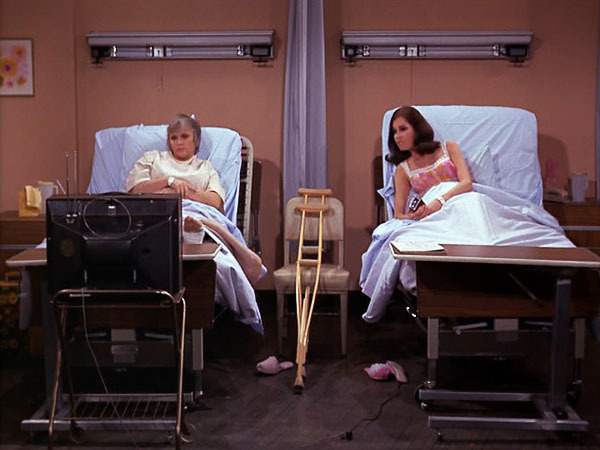 Her roommate – yep, in 1971, a tonsillectomy was an in-patient procedure – is a gruff, sassy broad whose manpanion comes by for a visit in between fights. And who is this dame with the ‘tude? None other than the incomparable Pat “Urusla” Carol! Meanwhile, Silvia and Ariel talk about the realities of hospital stays, privatized medicine, US health care, and Adam Ruins Everything: Healthcare. Be sure to check out the show on iTunes! Rate the show, subscribe, and write a little review to help others find the us! We’re also available on Stitcher, Google Play Music, SoundCloud, and the Pocket Casts app. Follow us or shoot us a message on Facebook, Twitter, and Instagram, or by email at afterallpodcast@gmail.com.